Let’s do a basic SWOT analysis of Starbucks. Starbucks (NASDAQ:SBUX) stock has soared more than 40% in the past 12 months, handily outperforming the S&P 500's 8% gain. But after that big rally, investors might wonder whether it's time to unload some shares. To decide, let's do a basic SWOT (strengths, weaknesses, opportunities, and threats) analysis of Starbucks' business. Starbucks has a solid record of top- and bottom-line growth. From fiscal 2010 to 2014, the java house's annual revenue rose 53% and earnings per share more than doubled. The company expects revenue to rise 16% to 18% this year, compared to 11% top-line growth in 2014. Starbucks recently took full control of Starbucks Japan, which should boost its top line this year with over $1 billion in incremental revenue. Since 2010, Starbucks' global store count has risen 31% to 22,088 company-operated and licensed locations. The company has also consistently posted comparable sales growth while increasing its store count -- something many growing chains fail to do. Last quarter, Starbucks' comparable sales rose 7% annually, with 7% growth in the Americas, 12% growth in the CAP (China/Asia-Pacific) region, and 2% growth in the EMEA (Europe, Middle East, Africa) region. Starbucks' comparable sales growth crushes rivals such as McDonald's and Dunkin' Brands' Dunkin' Donuts. Last quarter, McDonald's global comparable sales slipped 2.3% annually. Dunkin' Donuts reported 2.7% U.S. comp growth and 1.7% global comp growth. Starbucks' main weakness is uneven international growth. The Americas and CAP markets are faring well, but the EMEA region might weaken further due to economic troubles across that region. Although comparable-store sales rose in the EMEA region last quarter, revenue declined 10% year over year due to foreign currency impacts and a shift toward more licensed stores. Those gloomy results were offset by a massive 124% jump in revenue from the CAP region, mainly fueled by the acquisition of Starbucks Japan. Looking ahead, though, Asian currencies remain weak against the strong dollar, and economic slowdowns in China and Japan could throttle the CAP region's long-term growth. Starbucks is also spending a large amount of money on expansion. Last quarter, operating expenses jumped 17% annually to $3.84 billion, or 84% of its top line. Fortunately, rising revenue offset those expenses, boosting operating income by 21%. Nonetheless, investors should watch to see if the CAP region's growth can keep offsetting the EMEA region's shortcomings. To sustain Starbucks' growth in the CAP region, the company is boosting its store count, particularly in China. The idea is that rising incomes in China should fuel higher demand for "premium" Western products including Starbucks coffee. Starbucks recently opened its 1,600th store in China, and it plans to double its location count in the CAP region as a whole to around 10,000 within the next five years. Another area of growth is consumer packaged goods, such as coffee beans and branded K-Cups, which piggyback off the success of Keurig Green Mountain's Keurig home-brewing machines. During Starbucks' second-quarter conference call, CEO Howard Schultz noted that his company was the "No. 1 premium coffee brand in the K-Cup category," with more than 2.5 billion K-Cup pack shipments since launch. Starbucks is also experimenting with various concept stores. Over the past two years, Starbucks has opened tea bars, wine bars, and even "coffee museum" stores. If any of these ideas stick, Starbucks might evolve or expand them to boost sales. One ongoing threat to Starbucks' business is the unstable price of coffee, which is defined by the price per kilogram of pricier Arabica beans and cheaper Robusta beans. Starbucks, McDonald's, and Dunkin' Donuts generally buy Arabica beans, while Robusta beans are mainly used in supermarket brands and instant coffee. If Starbucks thinks coffee prices will rise next year, it signs supply contracts to "lock in" that year's supply at current prices. As of last quarter, Starbucks had locked in nearly 70% of its coffee supply for 2016. 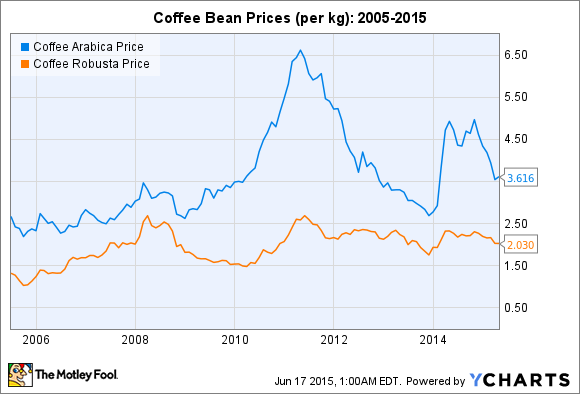 But if coffee prices fall below Starbucks' locked-in price, it loses money on that bet. Another threat is rising competition, notably across the United States and Canada. Starbucks has a healthy presence in the western and central U.S., but Dunkin' Donuts is firmly entrenched across the eastern seaboard, while Tim Hortons has a strong presence along the Canadian border. Dunkin' Donuts plans to challenge Starbucks by opening 200 new stores in California over the next five years, as well as 1,400 stores across China via a joint venture over the next two decades. Starbucks might experience near-term volatility due to soft sales in Europe, a strong dollar, and unstable coffee prices. But I believe the company's impressive ability to consistently grow its revenue, earnings, store count, and comparable sales easily outweighs those weaknesses and threats.